Ouch. Even though Fox gave a 13-episode series order to ancient Egypt set adventure series Hieroglyph during pilot season this year, it has now pulled the plug and canceled the show, before any episodes had even aired (it was set to debut during midseason). Kevin Reilly, who gave the series the greenlight, recently left his post as Fox’s programming chief. So I guess the new leadership (not yet announced) doesn’t agree with some of his choices. David S. Goyer has teamed up with Universal TV to develop Christopher Golden’s novel Snowblind as a potential miniseries, according to Deadline. Snowblind is set in a small New England town, where 12 years ago, 12 people wandered into a catastrophic snowstorm and vanished, leaving their loved ones and neighbors to pick up the pieces. As a new storm approaches, even bigger than the one from a dozen years ago, it shapes up to be even bigger and deadlier than its predecessor and stirs up all the old emotions and mysteries still lingering behind in the town. Snowblind is instantly involving and deeply scary. It will bring a blizzard to your bones (and your heart) even in the middle of July. Throw away all those old ‘it was a dark and stormy night’ novels; this one is the real deal. And watch out for that last page. It’s a killer. BLEEDING COOL: How did you get started drawing? DAVID T. CABRERA: As most of the artist, I begin to draw when I was a kid. I can remember myself drawing and tracing all of my favourites panels from Spiderman or X men. For a few year, I lost interest in comic art during my teenage, but suddenly, I discovered the European comic with all those idols, Moebius, Corben… and I reconnected with the comic art and the passion for it, and I did not stop drawing till today. BC: Who were your biggest influences? DC: I always remember my first X Men comic made by John Byrne, so yes, he was my first big influence, there were others like Alan Davis, David Mazzucchelli, Brian Bolland and my always favourite artist, Joe Kubert. Today I follow artists like Sara Pichelli, Andy Kubert, Eduardo Risso, Jean Paul Leon, Chris Samme, Marcelo Frusin, Goran Parlov… but, of course, I get influenced by a new artist every day. BC: What is your process for doing a page? How long does it take you? DC: I always begin with a small thumbnail, after that, I look for photo reference, sometimes I make a 3D model to help me. Over the thumbnail I make a new layer (yes, it’s a digital process) I refine all the pencils and I finish with an inking layer. It takes me a day or so, it depends on the page. BC: Where might folks have seen your work previously? DC: I haven’t done much professional work yet, I have done three graphic novels for Bluewater, I’ve made the first issue of Quest for Zenescope and I’m working for Dynamite right now. DC: Now, I’m working in the third issue of Bionic Woman miniseries for Dynamite. BC: What is your dream project? DC: There are a lot of characters and projects that I would love to make, but I always like the anti-hero type, like Wolverine, Batman,Constantine, Punisher, Green Hornet or The Shadow, but, any kind of project will be wellcome. For more on the Bionic Woman, click here. Inception reunion alert! Tom Hardy has officially joined the cast of Alejandro González Iñárritu’s Western revenge thriller The Revenant, which has Leonardo Dicaprio in the lead role. Based on Michael Punke’s novel The Revenant: A Novel of Revenge, Dicaprio plays a fur trapper who is robbed and left for dead by his companions after a grisly grizzly bear attack. Of course, he survives, and begins to seek revenge from those who wronged him. It’s unclear who Hardy will play, but likely one of the aforementioned traitors. We’re the Millers star Will Poulter is also on board, and perhaps more importantly, so is cinematographer Emmanuel Lubezki, just coming off his Oscar win for Gravity. Filming begins on September 22, with a Fall 2015 release planned. Bleeding Cool welcomes the return of Talking Comics, from Excalibur Comics, Cards, and Games in Shreveport, Louisiana, to discuss this week’s upcoming books, speculating about where they are headed, and discuss their favorite storylines. Another week, another great stack of comics to pick up from your local comic shop! Just a few major storylines continuing this week with more Original Sin (IS that really Nick Fury?! ), more Doomed in the form of SuperDoom, and it looks like the Green Lanterns could lose their place of power in the DCU! This is THE week for Guardians of the Galaxy issues as we get both Rocket Raccoon and Star-Lord series this week to get us ready for the new movie just a little over a month away! Curious as to what it was like when the X-Force and Deadpool first met? That’s answered this week with Deadpool vs. X-Force. And we see a new ongoing Tech Jacket series, created by Robert Kirkman, but with a different creative team. We had TONS of our monthly favorites that we talked about and so much more that we didn’t talk about because this is truly a huge week of comics. Magneto, Moon Knight, East of West, and more will be at the top of our reading stacks this week! Be sure to answer the Question of the Week! You should like it better than last week’s Question of the Week, since hardly anyone replied. LOL! Writer and Artist Jason Latour known for Scalped, Wolverine and B.P.R.D. let us in on a little behind the scenes look at one of his projects. He wrote Infinity: Against The Tide starring the Silver Surfer with art by Agustin Alessio… available here. Jason put together this animated storyboard for one of the scenes inside the book. It’s interesting to see how as an artist Latour writes for / communicates to another artist. Two months ago we learned Andy Serkis had a prominent but undisclosed role in Star Wars: Episode VII. Today the actor talked about his work on that film and another high profile Disney property, Marvel's The Avengers: Age of Ultron. Serkis has become synonymous with performance-capture since his turns as Gollum in The Lord of the Rings trilogy, Caesar in Rise of the Planet of the Apes and King Kong in, well, King Kong. He even launched his own mo-cap shop, the Imaginarium, consulting on films such as this year’s Godzilla. Sitting down with SciFiNow, Serkis spoke about his company’s responsibilities with regard to Episode VII, saying, “the Imaginarium is providing all of the performance characters, and I myself am playing a character in it.” Sadly that doesn’t shed much light on the question of whether Serkis will perform via motion capture or live action, though fans of his work have been quick to assume the former. DC Comics is launching two new ongoing series set in the Bat-universe in October, expanding the Dark Knight's shadowy corner of the DCU. 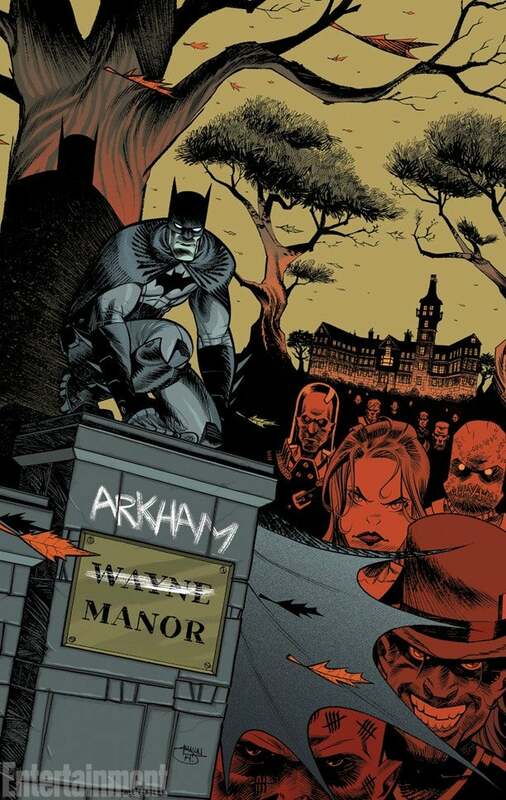 According to Entertainment Weekly, Arkham Manor -- written by Gerry Duggan (Deadpool) and drawn by Shawn Crystal (Wolverine and the X-Men) -- follows the former Wayne Manor, which has been turned into "the local psycho dungeon, and, perhaps predictably, some inmates wind up dead." Not much has shaken me up like the Cousin Maddie’s last episode of Twin Peaks. I could certainly never live in the Palmer house. If you’re not so delicate (ie. you’re made of iron) then perhaps you want to consider a move. Welcome to Twin Peaks have discovered that the house of Leland and Sarah Palmer is for sale. Here’s just a sampling of the brilliant comparison images they put together. Yep, there’s still a rocking chair there that featured in the show. The asking price is $549,950, which seems like nothing to an Oxfordian like myself. You’ll want to budget for some kind of Lynch-compatible exorcist and ceiling fan engineer too.